The best choice for a flat roof covering depends on your local climate, intended usage, and budget. 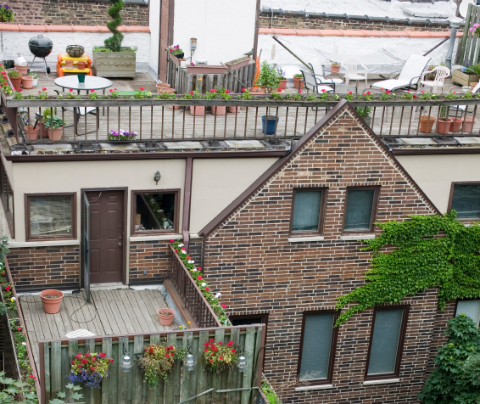 Here are a few of the most popular flat roof coverings. No matter which flat roof covering you go with, the most important thing is to ensure that the structure is sound. Flat roofs are not actually flat – there must be at least a 10 ° gradient to allow rainwater to flow off the roof. If your flat roof structure isn’t built properly, it doesn’t matter what kind of a flat roof covering you choose – rainwater will pond and eventually leak inside your home. Before you choose what kind of flat roof covering is best for your home, contact a qualified roofer for an inspection. When you are searching for the best flat roof covering, keep in mind that for all the options, no two manufacturers are the same. Evaluate how each manufacturer advertises their strong points, and consult with your flat roof covering expert to discuss your options. Your flat roof covering installer should be able to go over the finer points of all options, and help you decide what is best for you. Otherwise known as built-up roofing, tar and gravel roofing consists of a waterproof base layer, several layers of roofing felt glued together with tar, and a layer of gravel overtop as a ballast. This is one of the older flat roof coverings and is not used as often today, as membrane flat roofing is taking over. Tar and gravel roofing's decline in usage is due to the difficulty of installation, the difficulty in finding leaks, and the atmospheric air pollution it tends to create during its lifetime. Modified bitumen is an updated version of the older tar and gravel flat roof coverings. It is a membrane that consists of several layers of polymer-modified bitumen, often applied by heating the underside of the fabric and rolling it on. Rubber flat roof coverings are also known as EPDM (Ethylene Propylene Diene Monomer.) These are relatively new flat roof coverings made of synthetic rubber, very similar to that of an inner tube. A properly installed rubber roof is excellent at handling all sorts of weather, and holds up well to UV rays. PVC flat roof coverings are applied in rolls and heat-welded at the seams. These flat roof coverings are very pliable and durable, with excellent heat and puncture resistance. The main problem with the membranes of PVC flat roof coverings are their incompatibility with asphalt, which will eat away at these membranes. Separator sheets must be installed in between any asphalt and vinyl roofing. Homeowners who are interested in more information about flat roof coverings should consult with a qualified local contractor, who can help them make the best decision for their home.